One of the ways we do this is by allowing you to crop, filter, resize, and apply more transformations to images simply by adding parameters to the image URL. This is extremely useful when creating profile pictures for users, or an image sharing site like Instagram. Through this tutorial, I will demo how to create a photo-editor app, in which you can manipulate images within the application. 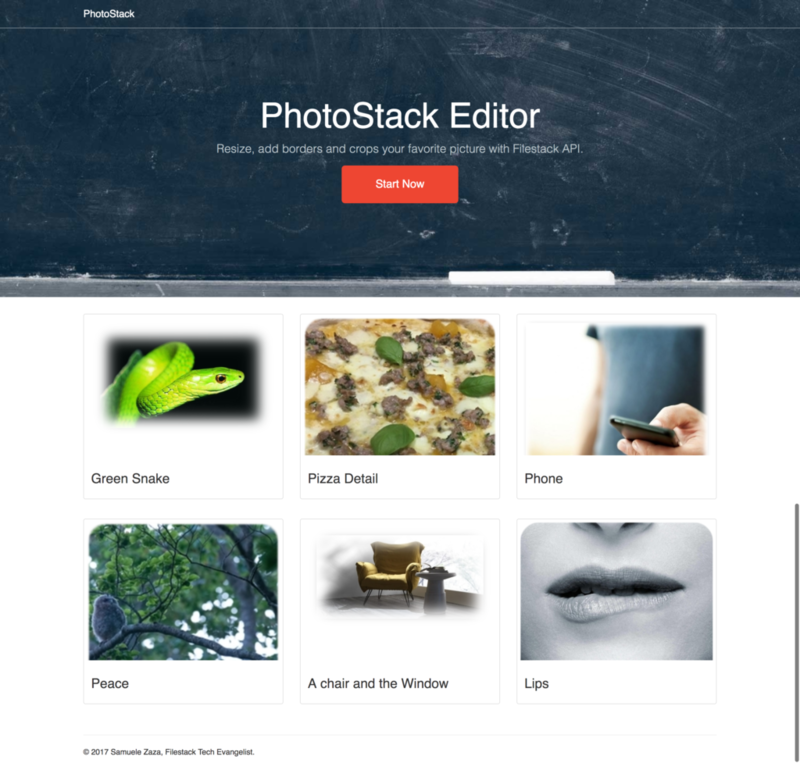 Let’s call it PhotoStack. Apply rounded borders by setting a blur factor to them. I customized some basic Bootstrap tutorial, added React to handle the views and communicate with the json-server, our mock API to retrieve and add new pictures. The complete app is available on my github! 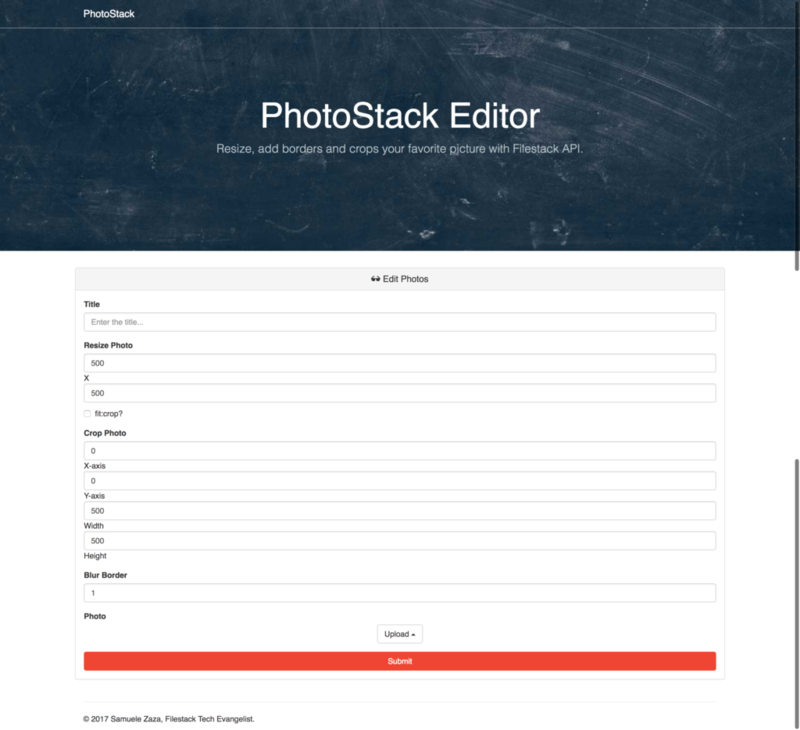 Before diggin’ into the Image Manipulation section of Filestack I want you to remember that to start using Filestack we need to include it in our index.html file and set the API key. This is something that I usually take for granted and don’t cover in the articles but it’s in fact a necessary step. So now I can add an uploader button in my React components. According to the documentation, we can customize the picture URL by adding for instance /resize=width:500,height:500. Have you noticed the difference? The first picture maintains the proportions so the height is not 300px, while the second it exactly 400×300 as we added fit:crop. The way we tell Filestack’s API to apply a certain image manipulation is the same as before, just add the parameters in the URL. To crop a picture we need to tell filestack the crop origin, a x,y pixel coordinate and the width and height of the cropped part. So for instance, providing coordinates of (0,0,100,100) instructs Filestack to start the cropping from the top-left pixel and the size of the rectangle will be 100×100. The last choice is to add blurred-rounded borders to the picture. Filestack allows the options blur to get a value within [1,20]. And that’s all, working with Filestack is very easy! As we usually do, we include the uploader thanks to pick, a function from Filestack. the handleClick function calls filestack function and once the promise resolves, it will set the file handle and the manipulation strings (the combination of the manipulations we have seen before) in the app state. The options to customize the uploader, onSuccess function and onError function. We limit the upload to picture by setting the mimetype to image/*. The uploader interface is shown in a modal thanks to the container property. openTo is the default source, the physical device. And we finished the tutorial. Congratulations! In this first tutorial of 2017 we considered image-manipulation again. Filestack provides loads of choices to enhance/customize our favorite photos so we digged into resizing, cropping and add blurred borders to photos. For each of the manipulations we have seen them in action with an example to better understand the parameters to add in the URL. Finally, we added the uploader to the app through pick function.